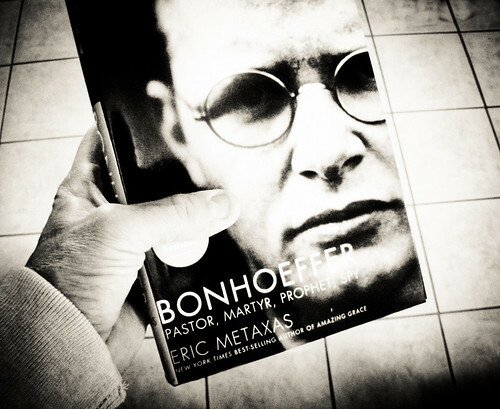 I'm currently reading Eric Metaxas's superb biography on the German pastor, Dietrich Bonhoeffer, called Bonhoeffer: Pastor, Martyr, Prophet, Spy. Probably most known for his classic book, The Cost of Discipleship, and for his involvement in an attempt to kill Adolf Hitler, Bonhoeffer lived a faith that was not limited to the four walls of a church building. His active opposition of the Nazi regime and sympathetic approach to the Jewish people of his day forces us in the 21st century to question what is appropriate behavior for the Christian who wishes to oppose the evil of her day. "One admires Christ according to aesthetic categories as an aesthetic genius, calls him the greatest ethicist; one admires his going to his death as a heroic sacrifice for his ideas. Only one thing one doesn't do: one doesn't take him seriously. That is, one doesn't bring the center of his or her own life in to contact with the claim of Christ to speak the revelation of God and to be that revelation. Understanding this claim means taking seriously his absolute claim on our commitment. And it is now of importance for us to clarify the seriousness of this matter and to extricate Christ from the secularization process in which he has been incorporated since the Enlightenment." A powerful challenge from a man that believed in Christ so strongly that he ended up giving his life because of his commitment to living out his faith as he understood it. One story tells of a despicable convict with a failed marriage who played a principal role in one of our country's most shameful political scandals. Another story tells of a man transformed by the love of God who enjoyed a nearly fifty year marriage and served prisoners and their families for the last several decades he spent on earth. Both stories speak of the same man - Chuck Colson - who died yesterday at the age of 80. For most Americans of my parents generation and older, Chuck Colson is known as the "hatchet man" of the Nixon administration, known for the Watergate scandal that eventually led to President Nixon's resignation and caused several members of his staff, including Colson, to spend time behind bars as a result of their roles in this affair. But for many evangelical Christians, Chuck Colson is known as the founder of Prison Fellowship, a ministry that has touched the lives of countless prisoners and their families through programs like Angel Tree, and a prominent author and speaker that has been a consistent voice of reason for the evangelical community in an increasingly partisan society. It is likely that the primary narrative you read - i.e. Watergate or Christian leader - depends largely on the source that is reporting on Colson's life. Many mainstream outlets insist on focusing on Colson's troubled past, whereas Christians typically center on his Christian life post-Watergate. To be true to who Chuck Colson was, both stories need to be told. Similar to the Apostle Paul who met Jesus on the road to Damascus, Chuck Colson was a horrible man whose life was radically changed after he met Jesus. Even those that doubted Colson's conversion story, told so well in his 1976 autobiography Born Again, must admit that his faith was sincere as he was still telling the same story of how his life had been changed by Christ nearly forty years after it happened. This faith compelled him to start Prison Fellowship to not only meet the spiritual needs of prisoners but to help care for their physical needs as an advocate for prison reform and a spokesperson for the families of those behind bars. Though still considered a political conservative after his conversion, it was evident that he was not the same man. A man that only cares about advancing his political career would not spend the rest of his life serving those that are among our nation's most despised and most forgotten members. But Colson understood what all sincere Christians whose lives have been changed by the power of the gospel of Jesus comprehend. It is that we are all criminals at heart; wicked people unable to save ourselves. But once we respond to the offer of salvation, God's power is sufficient to change even the most unlikely candidates -- whether that be Saul of Tarsus, Chuck Colson, you or me. Chuck Colson was a man with two stories. The first, more uncomfortable story was needed so that the second, more glorious story can be told. The complete story of Chuck Colson is a story of redemption and salvation. It is a story of new birth. One might even say that it is a story of an unlikely man being "born again." There are a countless number of blogs out in cyberspace that are written primarily for a Christian audience and/or from a Christian perspective. But which ones are the most popular? Kent Shaffer of ChurchRelevance.com has once again taken on the mammoth task of attempting to answer this question by providing a ranking of the most-read blogs by Christians. Some of these names may be familiar to you whereas others you might not recognize. I encourage you to take some time to check some of them out. I regularly read a number of the blogs from Shaffer's Top 200 list and even though I don't endorse all that is written on these blogs, it is helpful to know what many people are reading. "The collapse of marriage among blacks is well documented, but not the sexual, psychological, emotional and social toll this has taken on black women. Seven out of ten are single. Of the others, many are forced into "man-sharing." This crisis in the black “relationship market,” as Mr Banks calls it, starts with a “man shortage.” About one in ten black men in their early thirties are in prison. As a group, black men have also fallen behind in education and income, just as black women have surged ahead. Two black women graduate from college for every black man. As these women rise into the middle class, the men stay in the lower class, becoming less compatible. Many black women respond by “marrying down, but not out,” as Mr Banks puts it. But that makes bad marriages. 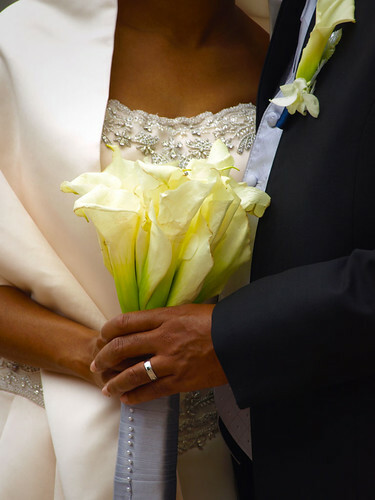 Two out of every three black marriages fail, about twice the rate of white marriages. The real problem is the behaviour of those few black men who are considered good catches. They often stay unmarried for the opposite reason: they have too many options. As one man told Mr Banks: “If you have four quality women you’re dating and they’re in a rotation, who’s going to rush into a marriage?” Even black men who nominally commit to one woman are five times as likely as their white counterparts to have others on the side." In my ministry within the black community, I've seen some of these realities and, unfortunately, with some individuals very close to me. But I've also personally witnessed numerous successful marriages between African Americans. If you are an African American man or woman, what is your response to this article? What solutions can be offered to reverse these current trends? 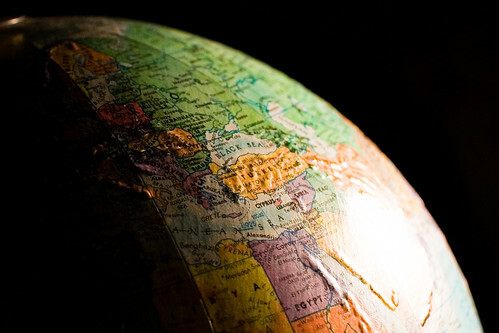 Jonathan K. Dodson has written a splendid piece for The Gospel Coalition entitled, "Why the Missional Church Isn't Enough," where he advocates for the need to continually look beyond our own borders even as we seek to reach those in our own community. "Church historian Kenneth Latourette (1884-1963) noted that the church has a history of advance and retreat, what he called "the pulsations in the life of Christianity." Lautorette points out that the history of the church is a history of oscillating influence, spreading the gospel across the globe over the centuries. This has resulted in new expressions of the Christian faith over time and across cultures. It is amazing to consider the diversity and uniqueness of the gospel throughout space and time among the peoples of history! Today, expressions of the gospel are exploding in Africa and Asia. God looks on the communication of himself, and the emanation of the infinite glory and good that are in himself to belong to the fullness and completeness of himself, as though he were not in his most complete and glorious state without it. Thus the church of Christ is called the fullness of Christ: as though he were not in his complete state without her. God's glory in an incomplete state? His glory is not full? Sounds awfully unorthodox. What is Edwards saying? If Edwards is correct, the full expression of God's glory can only be completed through the history of redemption. The history of redemption cannot be completed until "the end has come," and the end will not come until "the gospel of the kingdom has been preached throughout the whole world as a testimony to all nations" (Matt 24:14). God's glory is expanded when the gospel is translated into the many cultures of the world, entering new ethnicities, idioms, and habits. It will take the breadth of history to display the diversity of God's glory through the advance of the church. However, the church also retreats. Our passion for mission wanes. Even with the resurgence of missional ecclesiology, we fail in sharing and showing the gospel in our own cultures. Clearly, the missional church is not enough, not only in its scope of mission, but also in its motivation for mission. When the motivation of the church is mission, we are destined to retreat, tire out, and fail. What, then, should we do? Throw up our arms in surrender and blend fully into our cultures with the hope of missional memory loss? We need a greater, more captivating motivation than "missional church." When the motivation for mission is mission, people will revert to consumerism. However, if our missional endeavors are motivated by something greater, more certain, than our oscillating passion for the advance of the gospel, then there is hope. If the history of redemption will not come to a close until God's glory has been completed, then the assurance of mission starts and ends, not with the church, but with God! God's commitment to his own glorious expansion throughout space and time is the hope of the world. The hope of mission is not the church; it is Jesus committed to ushering his full, redemptive reign over all space and time, including every people." To read the complete article please click here. 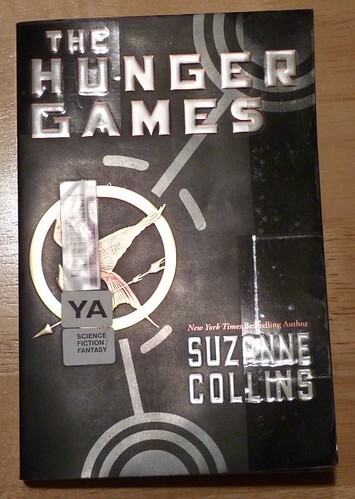 The Hunger Games, the young adult novel by Suzanne Collins, has not only taken bestseller lists by storm the past several years, but its film adaptation has been the leader at the box office the past few weeks. Released less than three weeks ago, it had the third highest grossing opening weekend in cinematic history and has already generated over $400 million worldwide. In spite of the immense popularity of the film, some fans of the book have taken to social media to demonstrate their displeasure with what they witnessed on screen. "In "The Hunger Games," wealthy Capitol citizens of all races and ethnicities come together to watch the 74th annual bloodbath of the same name. It seems some present-day moviegoers, however, are a bit less "post-racial." Earlier this week, some "Hunger Games" fans tweeted their discontent because the characters of Cinna, Thresh and Rue are played by black actors in the big screen adaptation. This, despite the fact that both Thresh (Dayo Okeniyi) and Rue (Amandla Stenberg) are described as having "dark skin" in Suzanne Collins' novel, while Cinna (Lenny Kravitz) is simply described as having short brown hair. Whether fans' remarks -- such as, "Awkward moment when Rue is some black girl and not the little innocent blonde girl you picture" -- stem from poor reading comprehension or intolerance, they're indicative of a larger issue in Hollywood, said Harry M. Benshoff, an associate professor of radio, TV and film at the University of North Texas who co-wrote "America on Film: Representing Race, Class, Gender and Sexuality at the Movies." "Hollywood has never been on the forefront of the civil rights movement," said Benshoff, who hasn't read or watched "The Hunger Games." Despite certain character descriptions being spelled out in the book, Benshoff said, people typically project themselves onto a character in order to empathize with that person. "For a white person reading a book, they're very rarely going to go, 'I'm just assuming this is a black character' if he or she isn't marked as such," he said. "A nonwhite person might project their own identity onto the character." Even when characters are described by the author as having "dark skin," some readers still assumed that the characters were white. This is just one demonstration of how our own racial prejudices and biases can cause us to not see what is quite apparent to others. All too often Hollywood has represented characters of color with white actors. In this case, Hollywood got it right... but some fans of The Hunger Games didn't. Sadly, there is probably more of this sentiment out there than we realize. To read the complete CNN.com story please click here.